One of my roommates, Scott Douglas '86 has made a nice career in running by writing a number of books with 80s Olympians Bill Rodgers and Pete Pfitzinger (a former training partner of mine). He is a former editor of Running Times and now a senior editor for them. Above is a TV appearance he made yesterday to hawk his The Complete Idiot's Guide to Running that he co-wrote with Bill Rodgers. Colin Leak '10 and former coach/runner Kathy Newberry were 3rd and 6th in their respective races in Trindad at the NACAC XC meet. the four Tribe harriers running took the first four positions with career-best and IC4A-qualifying times. Alex McGrath ran 8:18.06 for the win and a 13-second personal-best, while grad student Lewis Woodard was second in 8:21.26, over three seconds faster than his previous best. Rad Gunzenhauser ran 8:22.37 and Ted Richardson finished fourth in 8:24.68. 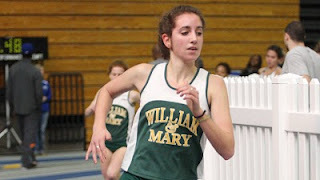 In the 3,000m, freshman Elaina Balouris (above) ran 9:47.89 to win the event and qualify for the ECAC Championships followed by Kathleen Lautzenheiser who shaved almost 10 seconds off of her previous-best to run 9:50.04 and take second. Lautzenheiser also came in under the ECAC barrier, her first championship qualification. In the pole vault, freshman Nicole Dory continued her strong rookie campaign by taking fifth with a height of 3.35 meters (10-11.75). 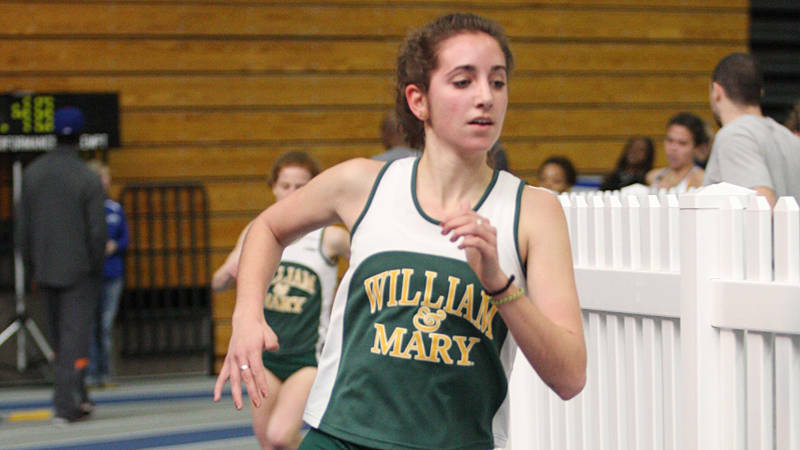 Nicole Dory '14 has gone from elite level gymnastics to already breaking the frosh pole vault several times in her short stint at W&M. Click the arrow to listen to the interview. I could be wrong, but Ed Moran's 3rd today, I believe, is his best ever in the world qualifying race. Colin Leak '10(thanks for the heads up from Ed Moran) was 13th in the race as well. Just earlier, Kathy Newberry was 13th in the women's race - missing out on making the USA team. Above is the men's finish. Here are the complete videos for both races. For those of you who were at W&M between 1978-1992, you might remember going on distance runs and chasing the plates pictured above hoping Chernock would stop soon and give you a water break in the dog days of August. Now he and Matt Lane '00 will be inducted in the Hall of Fame at our reunion on the 2nd of April (see details below). 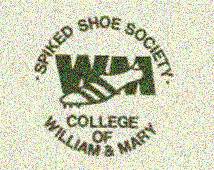 The smelly shoes pictured above belonged to Hiram Cuevas '89.